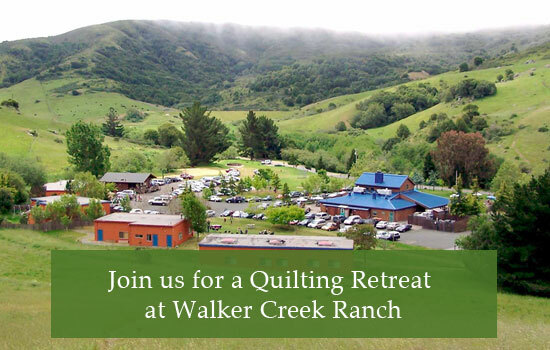 The Petaluma Quilt Guild holds a quilting retreat two times per year at Walker Creek Ranch. We typically go around February and August. Retreats are held over a weekend – Friday night to Sunday afternoon. Members and their guests are welcome to come for the entire weekend, come for a day or whatever you like. Meals and lodging are provided on site. Attendees bring their own projects to work on. There is a large workroom set up. Our retreat is at Walker Creek Ranch 14 miles out of Petaluma. We sew in a large well lit room room for many long tables and we stay overnight in semi private rooms. What that means is there are 2 – 3 twin beds in a room which hold 19 overnight. They cook all our food, and do the dishes too. We start our weekend at 2 PM set up with Dinner at 6 on Friday and leave at 3 PM Sunday after having lunch at 12. We have 3 meals on Saturday. Breakfast at 8 AM, Lunch at 12, Dinner at 6 and Breakfast at 8 and Lunch at 12 on Sunday. 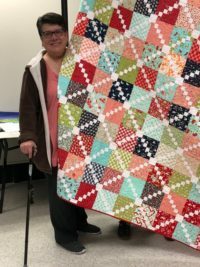 When we are not eating we are busy at our machines creating some wonderful quilts, or other creative pieces. We love to sew, talk, learn, and sew some more. Upon signing up a deposit of $50 for full time time goes is needed and for part time a 50% of cost is requested. You can email the guild if you are interested or talk with someone at the meetings.